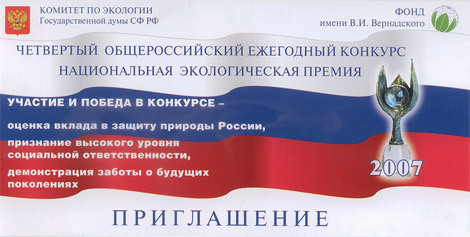 On October 23-25, 2007 in Moscow Central exhibition center “EXPOCENTR” at Krasnaya Presnya 4th International specialized exhibition “ENVIRONMENTAL EFFICIENCY” and a contest “NATIONAL ENVIRONMENTAL AWARD” took place. The events have been organized by V. I. VERNADSKIY Fund. The exhibition involved more than 80 participants, including large Russian organizations like „LUKOIL”, „TATNEFT”, „GAZPROM”, „URENGOJGAZPROM”, „ORENBURGGAZPROM”, German, Finnish, Latvian and other companies, also scientists: representatives of Institute of General and Inorganic Chemistry of Russian Academy of Science (RAS), Institute of organic chemistry of RAS, Institute of problems of chemical physics etc. At the same time an International specialized conference with 10 thematic sections took place. 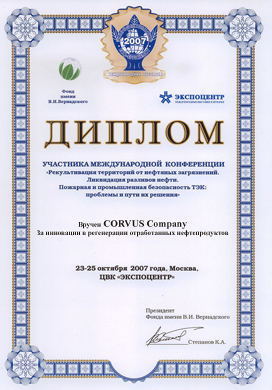 “CORVUS Company” innovations department director A. Polyakov has presented a report within a thematic section “Technologies and means of neutralization, recycling, utilization and regeneration of waste oil and oil products, waste sorbents, processing and utilization of oil-contaminated water and waste, territories remediation”. Reports included in this section have been mainly devoted to the following issues: environmental technologies of oil extraction; experience in eliminating oil spillages, drill and oil sludge utilization; modern appliances and technologies for prevention and elimination of oil and oil products spillage; experience in creating local monitoring systems of geological environment at oil processing plants; experience in implementing remote information in assessing ecological condition of transport geological-technical systems; developing equipment for oil sludge processing and oil products waste utilization. “CORVUS Company” representative A. Polyakov has presented a report “Waste oil products utilization”, reflecting “CORVUS Company” experience in collection, processing and recycling waste oil products and fuel preparation for boiler-houses. An important element in fuel preparation system is a mixer-disperser (DRS®), produced and sold by the company. Its novelty is approved with positive decisions for issuing patents of Latvia, Russia and Germany. “CORVUS Company” report on behalf of contest organizer — V. I. Vernadskiy Fund has been awarded with a diploma for «Developments in field of waste oil and oil products processing and regeneration».